1. Tell toddler that it's time to get dressed. He will say no and run away from you. 2. 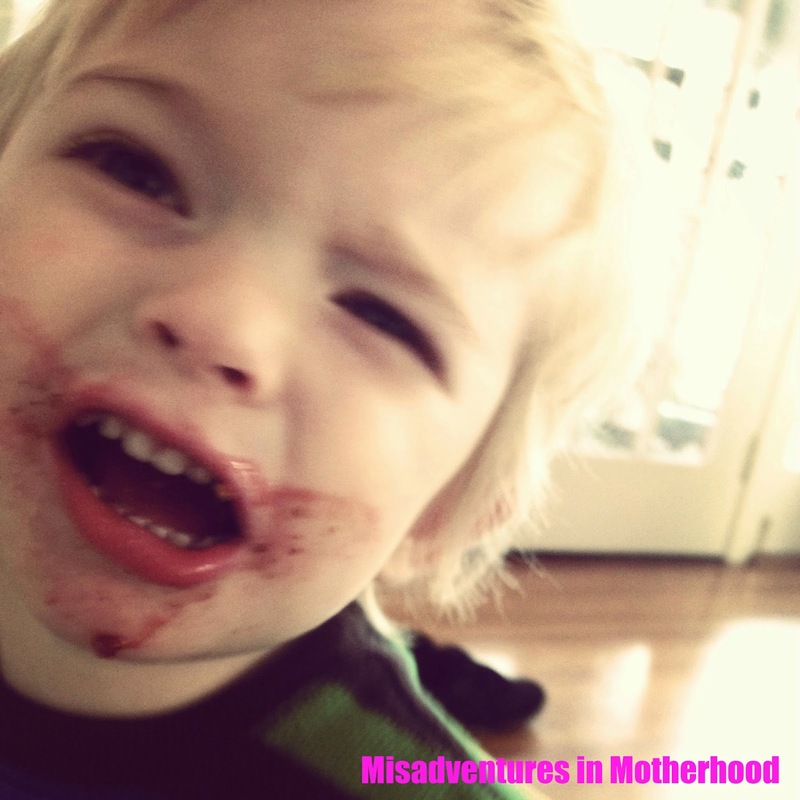 Search for toddler and find him in the pantry smearing jam all over himself. Tell him again that it's time to get dressed, especially now that he's covered in jam. He will say no, louder this time, and try to run away from you again. 3. Pick up toddler and carry him upstairs while he screams and smears jam all over your hair. 4. Attempt to place toddler on the changing table in his room. You dodge several kicks to your abdomen before he throws himself off of the table. 5. Tell toddler that he can play for five minutes and then it really is time to get dressed. 6. After five minutes, inform toddler that it's now time to change his diaper. Pick up toddler and place him on his changing table while, once again, dodging his flailing limbs. 7. Hand wiggling toddler your iPhone in the hopes it will distract him long enough for you to change his diaper and get him clothed. 8. While toddler is mesmerized by something he managed to find on your phone, quickly whip off his diaper and put on a new one. It is very possible his wet diaper actually weighs more than your toddler did when he was born. 9. Choose a cute outfit that you want your child to wear. Stealthily slip the pants on while he is playing with your phone. 10. Begin to remove your toddler's Superman pajama top (that is covered in jam) in order to replace it with a stylish, clean t-shirt. Toddler, realizing what you are trying to do, screams "NO" at the top of his lungs and holds down his pajama top with superhuman strength so that you are unable to remove it. 11. Explain to toddler that he can't wear a pajama shirt out in public, especially one that's covered in jam. He is not convinced. 12. Suggest to toddler that he can pick out the shirt he would like to wear but it cannot be his pajama top. 13. Help toddler climb off of changing table and open the dresser drawer that holds his t-shirts. Toddler pulls out every single shirt from the drawer and runs back and forth to his sister's room where he throws them into her crib. 14. While your toddler is otherwise occupied mimicking the behaviour of a University of Michigan fraternity member, you check your watch and mentally calculate how many hours it is until wine o'clock. 15. Tell toddler that he really does have to choose a shirt. Preferably now. He says no. 16. You tell him that you will get him an organic, sugar-free fruit stick if he chooses a shirt. This seems to persuade him. He selects a shirt that does not in any way go with the pants you managed to put on him 25 minutes ago. 17. You finally get his shirt changed while he chants "foooot stick" over and over. His outfit clashes so badly strangers will probably think you are color blind. You have not had enough coffee to care. 18. After you change your child's shirt, you try to put socks on his feet but every time you pull the socks over his toes he says "ow" and pulls off the socks. There is no logical reason for this since he has no injuries to his feet and his toenails are, for once, neatly trimmed. 19. You give up on socks and feel thankful that you live in Los Angeles and the fact that you are too tired to fight your kid on socks will not lead to your being reported to CPS. 20. You take your fully-dressed toddler downstairs to the kitchen and give him the promised fruit stick. While your toddler is in the living room eating his fruit stick, you reheat your coffee for the sixth time that morning. When you walk back into the living room, you see that your child has somehow managed to get fruit stick all over himself in the span of two minutes. 21. You decide that letting your child wear a dirty shirt is really no big deal since you no longer have the energy to leave the house.